Do you desire to have more friends, dear Single Mom? Do you want to increase your current community? Here are 10 tips that can help you develop your community. 1. Are you a single mom? Be confident in yourself as a single mom. You do not have to have all the answers at once. Be confident in what you do know. Being confident may make some woman avoid you out of their own insecurity. Though, I have found that confidence draws the right people to you…people who will be attracted to your confidence and strength. This same confidence and strength could keep that “fly by night” guy away from you. Men who are takers sometimes recognize women who are not playing games and they tend to want to stay away. Still be wise when people come around you. To be honest with you, sometimes as a single mom, I did not feel confident. So I would put on the face and the countenance like I was a force to reckon with. I faked it until I could make it. Until I could make the confidence work for me. 2. Wait for your own man. Don’t give another woman any reason to doubt your professional relationship with her husband. Your spiritual relationship with the Pastor should be above board as well. Wait on God. He has the right man for you. I believe there is a man for every woman and a man in every city or area for that woman even if she moves. At least that is what I believed for myself as a single mom. One of the things that I did when someone’s husband was helping me with mechanical things on my car or fixing my dryer, I would call the wife after the husband left and thank her for her husband’s time and effort. And I would let her know that her husband was on his way back home. Just keeping it above board. 3. Train your children at home on how to behave in public. Yes, you can practice with your kids teaching them how to sit quietly, how to interrupt politely and at appropriate times by waiting until you are done talking or the other person is done talking. Train your children how to be ready on time to leave the home so that you are not using them as the reason you are constantly late. And that might mean training yourself. In developing community, you will have more opportunities to take your kids with you. And that is okay. As a single mom, you do not always need a babysitter to attend some adult events of interest. So when my kids were 3 and 4 years old, we would practice sitting on the couch like we were in church or at a performance of some kind. I would give the kids there own paper and pencil. I would tell them to sit quietly for a certain amount of time. And I told them they were practicing for when we went out in public. Another training piece that I did for the young ones was to have them stand by the door and not move. I would walk away and tell them to just stay there. They would squirm and want to run to me smiling and laughing. But I explained to them that if they were ever in danger, in a position where they needed to stay until I said it was safe, I needed to know that they would obey. So an incident did happen while I was visiting a friend and my little one got outside the gate across the street. The child stayed until someone brought her safely back across the street. I shudder to think of what could have happened if I had not trained my kids at home. 4. Budget for a small amount each month or every other month to take your kids to McDonald’s or somewhere. So when the opportunity comes up with others, you can go out for ice cream, let’s say after church or after a sporting event. This way you are not breaking your budget just to make everyone happy and for once (or twice) you get to pay for your own kids. I am telling you, it is a good feeling. Now, I understand the mom who is going from check to check and you can’t possibly see how to do this. I was that way too. I once told the kids, “One day, we will be able to go to that restaurant!” Eventually, I was able to budget for $10 a month to take the three of us out. That meant happy meals but it was a start. So don’t feel guilty when you take your kids out. I did. It was like I didn’t want anyone to see that I was going through the drive thru to spend $10 a month on me and my family for the value meals. Now I can spend $10 a week. 5. In developing community and building confidence, how you dress is important. You might be okay with low top blouses or hip hugger pants showing your waist. And for now, that might be all you have. But they do still make classic waist pants and there are plenty of them in the thrift stores and consignment shops. Look for non revealing blouses that are tasteful for the modern girl. I am not suggesting you look like your grandmother in your clothing. I can tell you as a minister to women for over 10 years or really closer to 20 years, it is very hard to talk to a lady when all “the girls” are practically out of her top. Tuck it in ladies. Cover it up. It is not for sale and don’t be giving it away. This way, when you meet a nice couple who wants to befriend you and your kids, how you dress could take away immediate doubts to your motives and character. Yes, people will try to size you up based on how you dress. We live in a suspicious generation. So remember, we are talking about making friends, increasing our community and hopefully having fun along the way. And while these are only suggestions, I can tell you that I have so much community and I get compliments all the time for the tasteful way I dress. So I am not telling you anything I am not willing to live myself. I got another chance to minister to the public and the leader encouraged me to continue dressing just the way I had been. To me, that was a compliment. And as my children were turning into teenagers, I encouraged them to dress modestly as well. And now one of my kids speak all over the nation on stage before hundreds maybe thousands of people. Their dress is modest yet tasteful and age appropriate. 6. In being confident, it is good to go out when at the top of your game. You know what makes you feel good and vibrant. If you don’t, find out what it is. For instance, I did not go to the single’s group when I was not at the top of my game. Because while I am looking to build my community of single friends, some are not looking to be friends. Some are not looking to add positive-ness to my life. It is unfortunate. But so true. So case in point, one day I did go to the single’s group. I was minding my own business when I was approached by another single lady. She begin asking me about a former intended that she apparently dated in the past and the conversation just went downhill real fast. I was stunned and really appalled at the gall of a person to cast aspersions on others. To so blatantly gossip and tear down a person I dated and still had feelings for. It was her choice to share her own pain and experiences with me. But it is up to me in how I respond. So my response was something like this: I believe every person has some good in them. And when I meet people including men, I hope that they are better people from having met me. That they gained something from our interactions. I also reminded her that if we don’t teach men how to treat a woman in general then they will continue to date and treat women badly. She said to me, Good for you! Well, I must have been at the top of my game that night to have responded so succinctly and not get dragged down in telling my woeful stories to match hers and her bad experience with this man. I chose not to go there…to the bad side. Are we still together? Nope! Did he learn anything while spending time with me? I do believe so. I believe he actually grew as an individual. Put your thoughts in Clip Art to share with the world. 7. Is your plate too full? In building community around you, be aware if you can handle any other obligations or commitments. Sometimes we want friends so bad that we agree to spend more time than we have. We might join a group or committee when we might already be tired and full of needed activities. You need to know yourself to know if you can handle MORE. If you can not handle more, wait for better timing. I believe God has great timing for adding the right people to our lives and the right activities. How can I help you, dear Single Mom? 8. Be true to thine own self. You have to know your self to be true to yourself…to not compromise your own values. Many people have a list of things either mental or written down of things that they need to do everyday or every week. Some even have a list of things that cannot be in their lives. For me, it is necessary that I pray every day, read my bible daily and exercise daily. Of course I need to eat daily but I also fast weekly. Those are my rules of life. Another rule is to not lie, cheat or steal. I have to stay on top of that because the temptation of subtle lies, cheating and stealing could creep in one’s life. Like taking the pen from the cashier at the grocery store…if they did not give it to you to have. Cheating at the stop light or stop sign by running a yellow light that obviously is going to turn red on you or the stop sign that you rolled through. Lies of omission where you just leave out the rest of the details making someone come to an erroneous conclusion. That’s what I mean by it could happen in such a subtle way that you don’t realize it is happening at first. But to correct it when you realize it, so that what you do and say are really a good representation of who you are, of your character. We often think of what others might think of us. But what do we think of ourselves? What do we believe about ourselves? Is it true? Do we keep our word to ourselves? Are we women of integrity when we are all alone? Community: Where do you like to have it? 9. Do not be so eager to share your struggle as a single mom too soon. You might think, really? Why not? You can share that with your existing community of close friends. 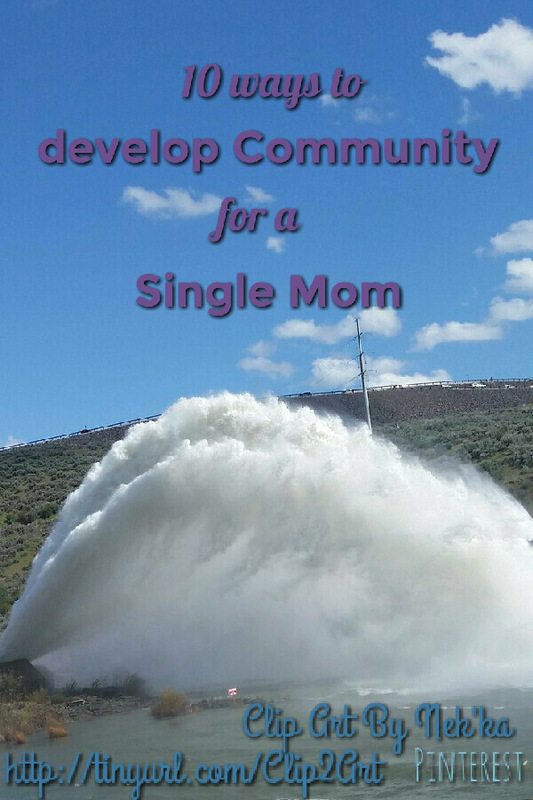 When developing community, new people sometimes already have their own ideas of who you are because you are a single mom. And when they meet you, within seconds, they decide if they like you or not and you might not have said your first word yet. So I caution you to not let the first words you speak to new people be about your struggles as a single mom. Be Holy spirit led in what you share. If it is too personal, it could turn people away because they might not want to reciprocate in being as vulnerable about their personal life. Also, I have learned that in building relationships, you need to build a foundation that can be strong enough to hold certain information and facts about our lives. I’ll give you an example: I was talking to a lady friend of mine who had had an argument with a man and it turned out bad. There was blood involved and alcohol. If this lady had told me that story when we first met, I might have been apprehensive that if she had too much alcohol around me and she got mad, I wondered if there would be blood involved. As I developed a relationship with this lady and we shared stories with each other and visited one another’s home and she had my girls over for a special “girly” birthday party, by the time that story actually happened, I knew the character of her as a friend and I knew to just be patient and be there for her as a friend. I was not suddenly afraid for my life or my girls when she came around because I had taken that time to build a foundation of friendship. We had built a strong enough foundation to be able to handle that incident that involved alcohol and blood with that other person. The same thing happened with women who were having men issues. If they had started out with that information like it was an identity name tag, we might not have been friends because it would have violated my list of what not to have in my life, which is sleeping around. Sorry! That is on my list of do not’s, forever and a day. So to be around someone doing that is not someone that I would be looking to for adding to my community of like minded individuals. Yet I have met wonderful women who just needed to surrender that area of their life to God and ask God for help to not do that any more. I got to be friends with these ladies before the story of their struggle came out in our relationship. I prayed with them. I was their friend. And guess what? They got delivered from that lifestyle. It had become a habit for them whether with just one man or more. It was something that had to be dealt with. And because I got to KNOW THEM before I KNEW THEIR STRUGGLE, I was able to handle the information. So I hope you can relate to what I am saying and think of a struggle you might have and it could be an issue for a friendship. And it is not that you are trying to be deceptive or hide who you really are. But your new relationship might not be strong enough to hold the information that WILL BE disclosed eventually but at a better time. Because with some information, there never seems to be the RIGHT TIME to talk about some things but there is a better time. Here is a way that you can test the waters in creating a safe environment in friendship and community: share just a little bit of information. Watch their reaction. See if they are trying to one up your story or show that there is common struggle or interest in helping. Or you might see that they are offended by that little bit of information you shared. Be careful with your pearls. And yes, some of your struggles are pearls in that they could be working to make you a wonderful masterpiece, increasing your faith and so on. You might see it as a test. And your kids are watching you to see how you deal with this struggle. So remember, it came to pass. This, too, shall pass…if you let it. Learn from it! 10. Don’t judge others so quickly. Though they might judge you, be slow to get to know who people really are. When I meet people, I ask myself who they remind me of so that I don’t confuse the two people though they seem so similar in looks or ways. Some people hit it off right away. Are you ever instant friends? Usually not. Stay in the acquaintance mode until you have enough time observing them and they you, before you call them a friend. I had to remind my kids of that when they were younger. And some adults I am around use that word, friend, so freely and I just wonder…are those people you are speaking of, are they really your friends? I have been amazed at how many women I have met and just knew they were my new best friends. Not! The “holes”, the struggles in their lives were revealed as we got to know one another. So don’t be quick to judge a book by it’s cover. It might feel good when you meet them. But every one should go through the proving ground…usually. God has his fast assignments sometimes where you get to know someone quickly for a God purpose. And he will reveal that to you. I’ve had that happen more than once. For me, it was a crisis around the corner usually in her life and we had to become quick friends so that I would be in the right place at the right time to be a help in the time of need. God knew they would turn to me and they did. Sometimes the friendship continued and other times it did not. It depended on how big the crisis was and if all parties could “bounce” back into a normal friendship after the crisis was over. In not judging too quickly, don’t let a woman’s clothes and car they drive have you making the wrong assumptions. They could be one payment from repossession driving the latest SUV or they could be millionaire driving the oldest car you’ve seen in a long while. Watch the jealousy. Try not to prejudge. They may have wisdom you know not of and be the one who is there when no one else is. Or they could have “nothing” upstairs and you can never get a reading on them because there is nothing to read. Don’t judge. Just ask God what his purpose is for your relationship with these dear ladies no matter where they are in life… struggling, doing well, brainy, rich or poor. If you have read this article all the way to the end, you might be the type that ends up “having the goods” for most of the people around you. You might think, really? Once again you might question, I am in a more stable position than this new person? It is sometimes about how we can help not how someone can help us. Some Times! And why not? We all have gifts and callings. We have something to add to this place called earth with millions and millions of people. There will always be someone who knows less than us in some area of life that we can share with. There will always be someone who could benefit from our prior experiences. So be open to being the one who will share, encourage, enlighten and spread hope. My “passion” for community in my personal life is seen through my “Why” for doing business and also is implemented as an asset in my business world of creating community among other entrepreneurs and independent associates, especially single mom entrepreneurs. Identify some single mom business owners and independent associates and commissioned reps who would want more exposure. You can share their social media post sometimes. Dear Single Mom, you may have much more than you realize. Share it! Share the good you have! Be a positive influence on the ones around you, old and new. Young and old! My name is Nek’ka Migel and it has been my delight to share with you 10 ways to develop community as a single mom. And finally after years and years of praying to live life with people, I have lots of community (people that I live life with) and I am enjoying my community almost daily. I like my private times by myself. And I know my community is just a text away, a phone call away and the next visit is just hours away. If you have been encouraged by this post, please share it! Join the closed Facebook group at Single Moms Unite! with the purple logo. Like and have your friends like the page, Single Moms Unite!, LLC to get awareness. Great tips! Especially liked the training kids bit. Very useful for every mother. Great post and a real support for single moms out there! Keep your head up, and shine!!! Thanks, Dr. Alina Marcu. I appreciate your comment!